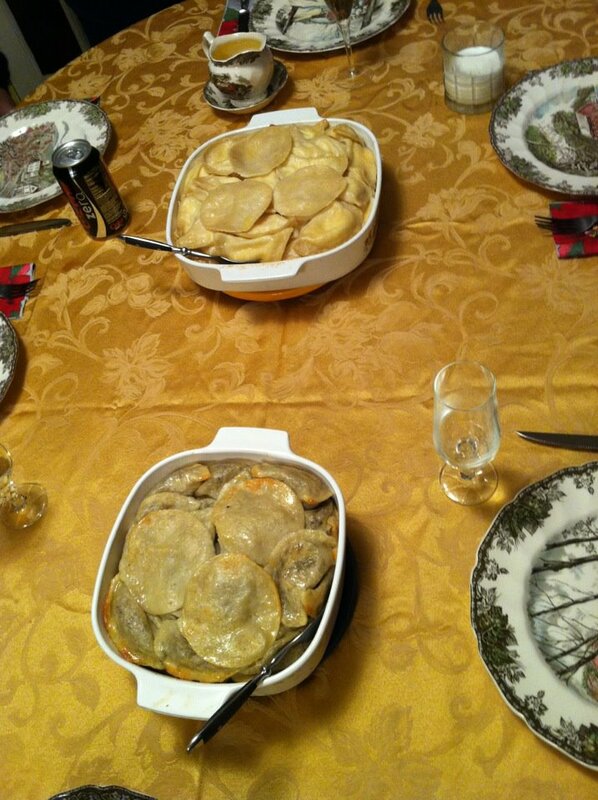 Great-Great Uncle Albert Joseph Pleau: On With the Show! Out of the three performing Pleau brothers, I think Al had the most experience, exposure, and consequently, fame. In 1903, newspapers reported him playing piano (another piano player!) and performing skits with his wife, May, as part of Shield’s Vaudeville in Montana and Washington. 1904 is the first mention of his doing blackface comedy in Los Angeles. Blackface appears to be his “schtick”, as he performed it for many years all over the country. Some of the companies he was with were: Haverly’s Mastadon Minstrels, Hawley’s Minstrels, and even his own Al Pleau’s Minstrels. His wife Henrietta was even part of the act during their marriage. Early in his career, Al played a leadership role for the causes he cared about. 1908 was when he seems to have put together Al Pleau’s Minstrels that performed a benefit for the Acadia Hose Company in Newark, NY. In 1912, he was director and musical director of the Western drama, “The Half-Breed” in Le Roy, NY that was to benefit St. Joseph’s Italian Church. Another benefit that Al participated in was after World War I. On April 29, 1919, a day of entertainment was provided to a number of veterans who fought at Argonne at the country home of Senator James D. Phelan in Saratoga, CA. Al was named the “vaudeville tenor”. Al must have made many friends in show business. In 1906 he contracted the measles, which affected his vision for a while, making him unable to perform. So in January 1907, a benefit was organized for him as he recuperated, perhaps to make up for his lost income. 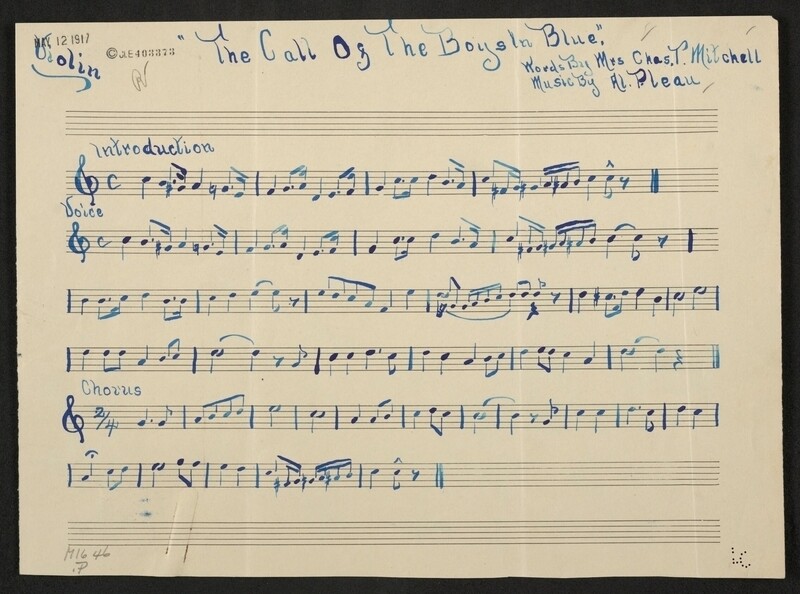 My big thrill recently was finding the sheet music and manuscript of “The Call to the Boys in Blue” (the manuscript says “The Call of the Boys in Blue”) on the Library of Congress website! I wouldn’t be surprised if he wrote even more songs. As vaudeville declined, so had the articles about Al’s performances. In 1922 he played Dave Tolliver in “The Trail of the Lonesome Pine” with the Hildebrand Company on stage in Klamath Falls, WA. I suspect that stage acting was the direction Al’s career took, as he was listed as an actor in his 1940 voter registration (he was a Democrat, by the way). For all I know, he may have done radio or even some film roles, but I haven’t found any evidence of that yet. I first discovered that my great-grandfather was a musician via the Rochester City Directories, which the Monroe County Public Library has made available on line. He is listed as a musician in 1902, then from 1910-1918, and as a shoemaker before and after 1902, then as of September of 1918. 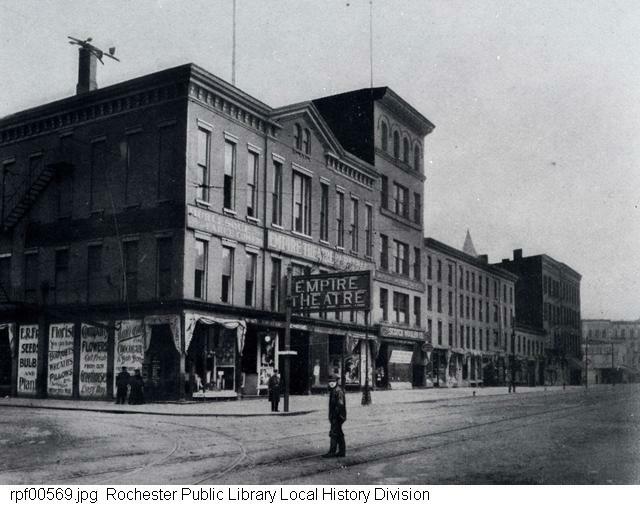 The only time his employment address was listed was 1914-1917 (282 West Main Street, which was the Empire Theatre). As I stated in my previous post, George seemed to get his first taste of performing while attending Our Lady of Victory School. In 1890, he performed in “Le Distrait”, and in 1891 he played Brun, King of the Gnomes in “The Interviewer and the Faries”, which was an operetta. I had no idea what kind of a musician he was until I came across a 1902 ad in the Wayne County Review (which I found on http://fultonhistory.com/Fulton.html , an awesome source for New York State newspapers). He was a pianist, just like his future wife Bertha and his son! In a Google Books search (“Catalog of Copyright Entries: Musical Compositions, Part 3, Volume 22, Issue 1”) I found that he wrote the melody to an unpublished song in 1927 called “Stop Time Buck Dance”. I have no idea how he and my great-grandmother Bertha met, but I like to think that perhaps music had something to do with it. Did they sit side by side at the piano, singing songs? I’ll never know, but it is a nice mental picture.